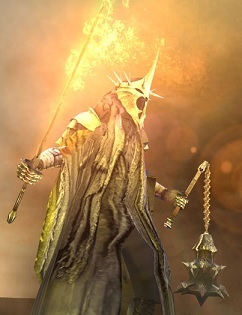 Eärnur - "When Eärnur received the crown in 2043 the King of Minas Morgul (the Witch-king) challenged him to single combat, taunting him that he had not dared to stand before him in battle in the North. For that time Mardil the Steward restrained the wrath of the king. Minas Anor, which had become the chief city of the realm since the days of King Telemnar, and the residence of the kings, was now renamed Minas Tirith, as the city ever on guard against the evil of Morgul. From that point on, the Line of Kings was broken and the Stewards ruled Gondor (until the Return of the King).